Shell-and-Tube Heat Exchanger (version 1.1)- is a user friendly program which for a given heat exchanger initial conditions and geometry predicts outlet temperatures of both shell-side and tube-side fluids, heat exchanged, pressure drop on the tube sides and fluid velocity in the inlet/outlet nozzles. For a given input and output conditions the program can estimate preliminary heat exchanger design parameters. Program assumes: * heat exchange between counterflow fluids only * shell insulation * heat transfer with ambient air. * shell-side fluid heating is possible * evaporation and condensation are not considered * results can be saved(into)/loaded(from) *.hec file. 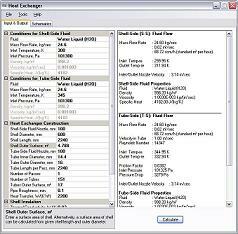 Shell-and-Tube Heat Exchanger is a user friendly program which for a given heat exchanger initial conditions and geometry predicts outlet temperatures of both shell-side and tube-side fluids, heat exchanged, pressure drop on the tube sides and fluid velocity in the inlet/outlet nozzles. 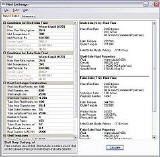 Unit Converter Pro - An enhanced units conversion program. This version contains more than 600 units. It allows you easily to create any units you want and as many as you want. DreamCalc Professional Calculator - Provide an extensive range of financial functions for the people who familiar with advanced financial calculators.